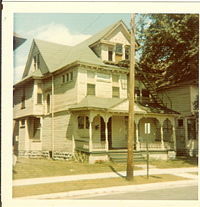 726 was a one and a half or two story frame dwelling built for $2585. Its dimensions are not recorded in the initial building permit but the wrecking permit lists it as 25x40x18. It seems to have been built with plumbing but not electricity, which it got in 1920. The first 40+ years of its life are nondescript with only sporadic plumbing and electrical work done. In 1939, the house was reroofed. This 1939 permit also lists the building as a duplex. The building again experienced only minor repairs and appliance replacements until 1960 when it was reroofed again. 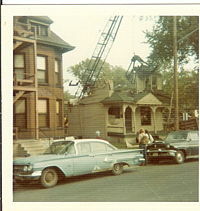 In 1972 it was wrecked along with the rest of the houses on the block (except 722-724). The wrecking permit lists it as a single dwelling unit for 5 residents. The building was owned by Wagner's company until at least 1960.